11/12/13: After finishing the piecing on Tumbling Stars and dreading appliqueing the borders onto it (I truly don’t like appliqueing! ), I began thinking about making a quickie quilt for snuggling on a sofa. We don’t have a sofa so I only guessed on a size. It was stitched on my vintage Singer 301a machine. The fabric strips measure ¾” after sewing, allowing use of lots of colorful strips in a smallish quilt. 12/2/13: I’m very nearly finished with the main part of the top. Lots of fabric cutting was involved because I don’t keep this size strips on hand. I’ll add a solid thin frame (maybe black) and a pieced border. I have gazillions of half square triangles left from other projects so I’ll hopefully make the border from them. I’m seriously considering machine quilting as quilting by hand takes much more time than I want to invest in this simple quilt. I also want it to be very durable. 12/9/13: After giving much thought to machine quilting, I decided to hand quilt this top in a hoop (since the frame is otherwise engaged). I have little experience machine quilting and didn’t want to take a chance of ruining it. I’ve decided to give the finished quilt as a Christmas gift. We’ll see if I can possibly finish it by then….. FAT CHANCE!! I think this quilt turned out grand, especially considering it took less than 6 weeks from first fabric cut to last stitch. 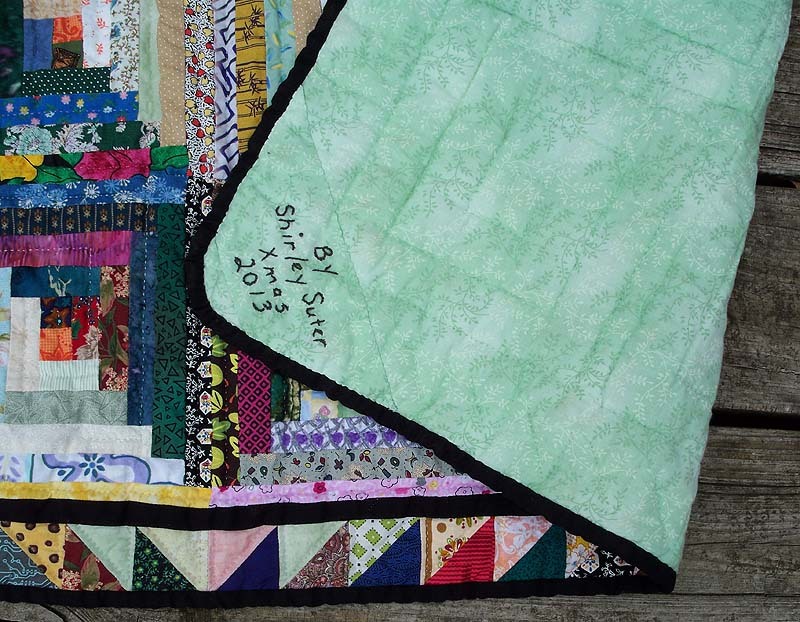 The quilt features bright orange ‘hearth fires’ on each block, 3/4″ logs, and 1 1/2″ sawtooth border. It has a small black frame and black binding with rounded corners. The finished size is 64″ by 48″. Shirley, Just love your log cabin. I can’t believe you got it done in six weeks! I just started my first log cabin and really love the block. Already have a another one planned! Thank you, Carla. 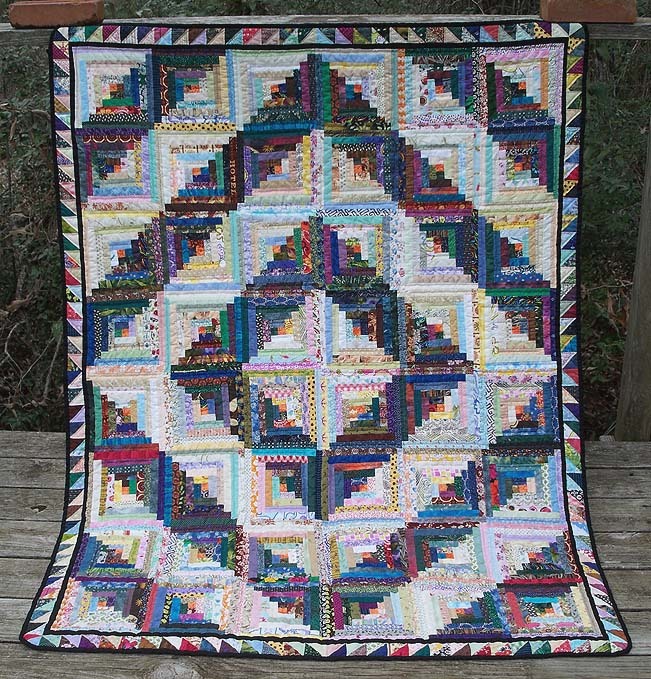 Log Cabin pattern is my ‘go to’ design when I need a quick quilt. I’ve got several bins of strips I’ve now cut to specific sizes so I can just grab a bin and sew like crazy. I also use a vintage Singer 301 machine. That baby sews a beautiful straight stitch FAST so the most time-consuming thing about this quilt was the hand quilting. I stitched every time I sat.